Hot tub deliveries tend to be relatively simple affairs. Our trained professionals use equipment and leverage to simplify the process. As a customer, imagine the hot tub you purchased standing on end as this is how most deliveries occur. The spa is dragged on a sled or dolly from the delivery truck to your desired location. Now walk the path that the delivery guys will take and make note of any potential obstacles. Things of concern are steps, gates, AC units, steep slopes or tight corners. The width of your gate must exceed the height of the spa. Measure at the top and bottom of the gate as they may be slightly different dimensions. Also remember to account for gate hardware. Sometimes a crane is required to lift the spa over the house. You may be surprised to learn that average crane costs are only around $350 to $500. 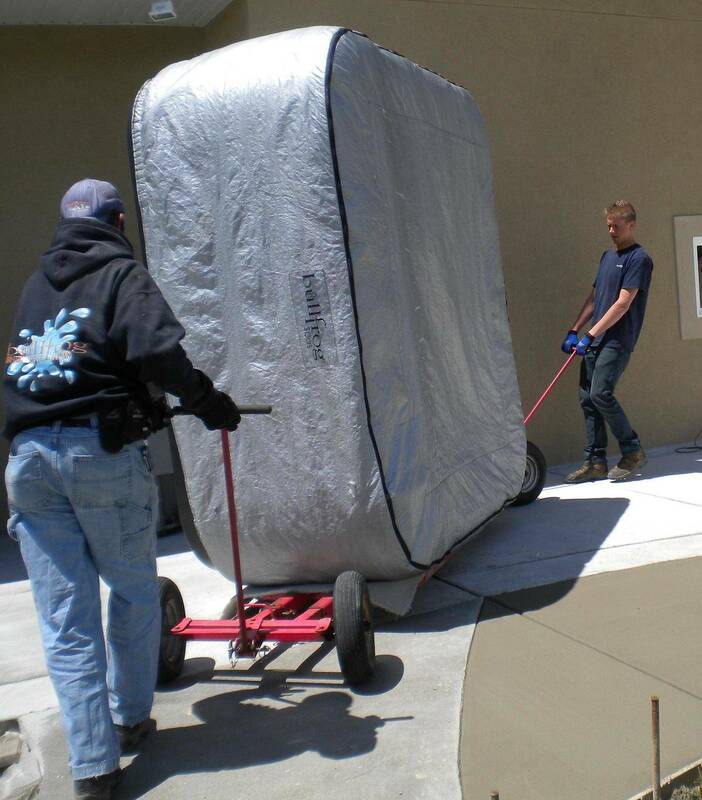 As a courtesy to our customers, Colorado Custom Spas will arrange for the crane to arrive on delivery day. While the cost of the crane is the responsibility of the customer, we have built relationships with all of the local crane companies over the years and will know which company and crane size will be necessary for your particular delivery. In the most extreme situations, the use of a helicopter may be required. This costs a bit more than a crane.